We are so excited to be participating in this amazing event for the 5th year in a row! Join us for the Morris Animal Refuge’s largest annual fundraiser, the Fur Ball. This year, the 23rd Street Armory will be transformed into a spectacular night at the carnival. Marvel at the performers, indulge in confections & savory treats, and revel on the dance floor. Your support will be benefiting the Nation’s oldest animal shelter with vital programs like the LifeSaver Fund, Fostering & Adoption Program, and the Low Cost Spay & Neuter Program. 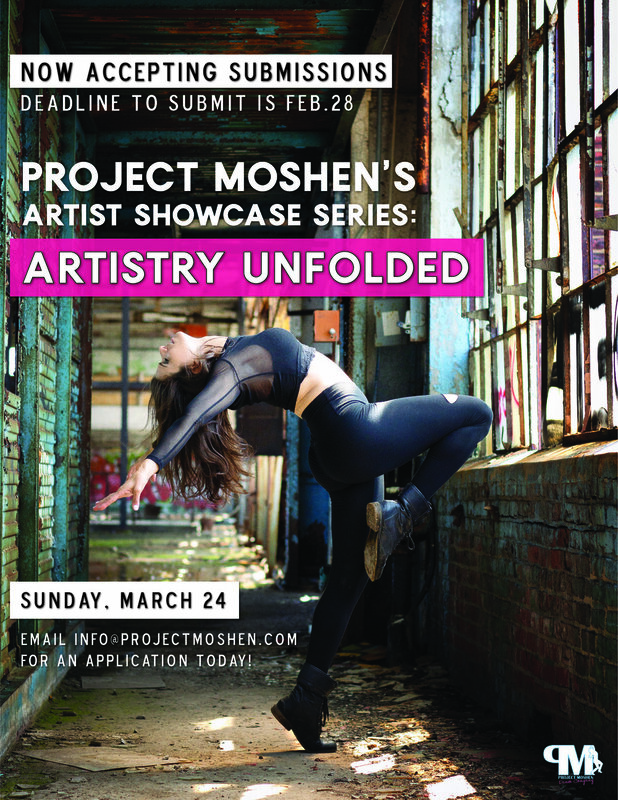 Project Moshen Presents, Artistry Unfolded, an Artist Showcase Series. A.U. brings artist from all over the Philadelphia area under one roof to showcase young an up and coming choreographer's work in an intimate black box theatre. Artistry Unfolded was created as a platform for local Artist to present new works in progress, show their creativity, network and broaden their audience. 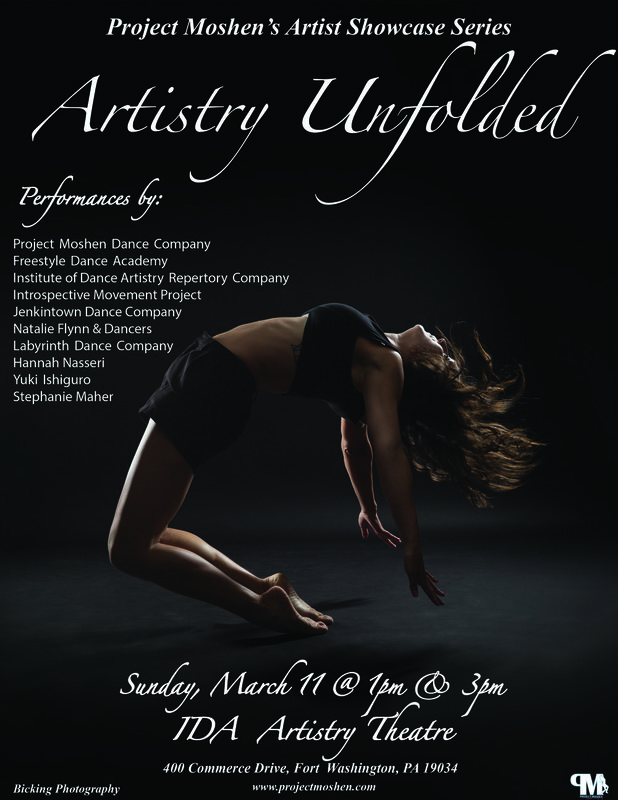 Artistry Unfolded is a great performance environment for professional and pre professional dancers alike. EMAIL US TODAY FOR AN APPLICATION! Join Project Moshen on December 1, 2018, at Venice Island Performing Arts & Recreation Center, for their 5th annual winter production “EXCERPTS”: A Benefit Production. This holiday season, ProMo, Philadelphia’s all Female Jazz Dance Company, is teaming up with the National Ovarian Cancer Coalition (NOCC) organization in honor of all the strong, beautiful women fighting cancer. This production is dedicated to Artistic Director Kelli Moshen's mother, Jodi Moshen, and in the spirit of giving this holiday season, proceeds from the evening will be given to the NOCC. The evening will include light fare, raffles, a silent auction, along with dynamic performances from your favorite ladies! This special show will include various highlights Project Moshen has produced over the years, new pieces, and a summarized version of their latest production, WOMAN. "EXCERPTS" will intrigue, excite, and kick off the holiday season right, including guest performances by our friends JUSTSOLE: Street Dance Theater. Be sure to join Project Moshen for our Welcome Reception, before the show, when the doors open at 7pm. There will be a raffle & silent auction, with items donated by our generous sponsors. Raffle tickets will be sold before the show and during intermission. There will also be refreshments & treats provided by our friends at Sweet T’s Bake Shop. Give back this holiday season by supporting the local artists of Philadelphia, along with Project Moshen's newest partnership with the National Ovarian Cancer Coalition. Doors open at 7pm - Welcome Reception : Food, raffles and more! We are looking for strong, athletic, technically trained female Jazz dancers. Must be over the age of 18yrs. Must have transportation as rehearsals take place in the suburbs of Philadelphia. Please prepare a 30 second solo to perform. Please email info@projectmoshen.com to RESERVE your spot today! MASTER CLASS & PRE AUDITION WORKSHOP! Project Moshen Audition Saturday, Aug. 25 @1pm at the Performance Garage! Come on down to this pre audition workshop to see what's in store for you! Tickets $35 - Click here to purchase! Are you ready to kick summer off with Project Moshen? Project Moshen will be hosting a Pop Up Workshop Series all summer long! Come move with your favorite ProMo girls and learn pieces from the company's commercial, athletic, jazz repertoire. During this high energy class you will learn the jazz technique behind Project Moshen's movement, have fun & have the experience of a lifetime! Must be 13 years or older to register. Come see an excerpt from our 2017 home season show WATERFALL at the 2018 BOOKING DANCE FESTIVAL NYC as part of APAP at Lincoln Center on January 13. TICKETS: http://www.jazz.org/events/t-7128/ - For entire showcase. You can come and go as you please. Project Moshen will be performing during the 7:30pm time slot. Show starts at 7:30pm - Tickets on sale October 2017! WHITE WAVE's 17th Annual DUMBO DANCE FESTIVAL at the Gelsey Kirkland ArtsCenter, featuring 70 contemporary dance troupes with 350 performing artists from across the US, and from Switzerland, China, Hungary, Spain, Japan, Korea, and Italy. 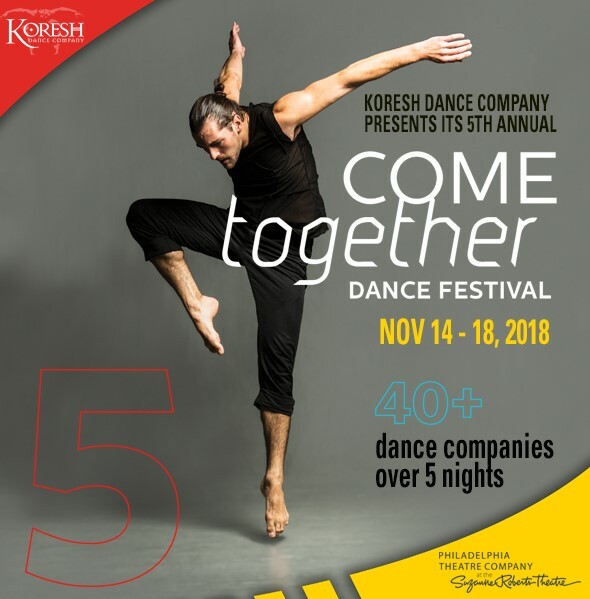 Project Moshen Dance Company is excited to be performing on Sunday, October 8 @4pm line up! Join ProMo for this hour and a half master class learning their athletic, intricate, innovative style to one of their newest pieces for their 2018 season! Must by 14yrs or older to participate. to receive a registration form. Thinking about auditioning for ProMo? Come out to this master class to get a sneak peek of whats in store for your audition! Artistry Unfolded, brings Artists from the Philadelphia area under one roof to come together and perform in an intimate black box theatre. Artistry Unfolded was created as a platform for local Artists to present new works in progress, show their creativity, network and broaden their audience. Artistry Unfolded is a great performance environment for professional and pre professional dancers alike. Join us on Sunday, March 12 at 1pm & 3pm for an afternoon of great performances . 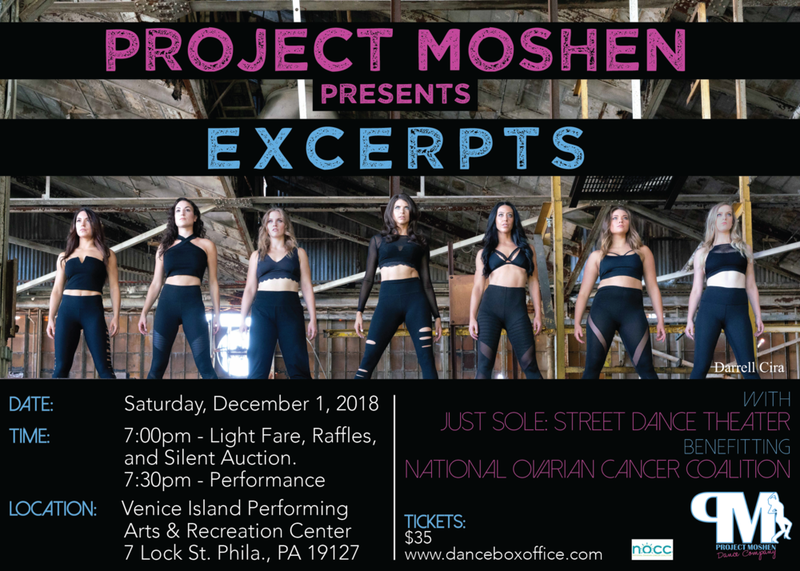 Join Project Moshen for an exciting night of dancing, raffles, and holiday fun as they present their 3rd annual charity show," Connecting Through Movement", on Saturday, December 3rd at the Performance Garage. Project Moshen and Philly's premier companies are coming together on one stage to benefit Make-A-Wish foundation. Selected works include newly revealed dances choreographed by Kelli Moshen and an excerpt from Project Moshen's Spring 2016 show, "COMING HOME". Featured performances include Asya Zlatina & Dancers, Introspective Movement Project, Temple University's D2D: The Company, and SkyDance Philly. Be sure give back this holiday season by supporting local artists and Make-A-Wish Foundation. Hosted by the Jewish Heritage Programs Young Professionals Network on Sunday, November 6th @ 11AM at 1700 Chestnut Street Apartments Community Room. Open hip-hop workout/ dance class led by Kelli Moshen and Project Moshen Dancers! Get ready to sweat, shake your thang, and celebrate a great program! Please venmo @JewishHeritage $5 to sign up! Email Michelle@jhp.org for more information.